Maryland is a state in the east of the United States. Its U.S. postal abbreviation is MD. Its Associated Press abbreviation is Md. USS Maryland was named in honor of this state. State Song "Maryland, My Maryland." George Calvert, 1st Baron Baltimore applied to Charles I for a new royal charter for what was to become the Province of Maryland. 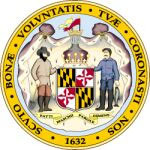 George Calvert died in April 1632, but a charter for "Maryland Colony" (in Latin, "Terra Maria") was granted to his son, C�cilius Calvert, 2nd Baron Baltimore, on June 20, 1632. The new colony was named in honour of Henrietta Maria, Queen Consort of Charles I. The English colony of Maryland was founded by Lord Baltimore who on March 25, 1634 led the first settlers into this area which would soon become one of the few dominantly Catholic regions among the English colonies in America. Maryland was one of the key destinations of tens of thousands of British convicts, which carried on until independence. The Maryland Toleration Act was one of the first laws that explicitly tolerated varieties of religion (as long as it was Christian), and is sometimes seen as a precursor to the First Amendment. Originally, based on an incorrect map, the royal charter granted Maryland the Potomac River and territory northward to the fortieth parallel. This was found to be a problem, because the northern boundary would put Philadelphia, the major city in Pennsylvania, within Maryland. The Calvert family, which controlled Maryland, and the Penn family, which controlled Pennsylvania, engaged two surveyors, Charles Mason and Jeremiah Dixon, to survey what became known as the Mason-Dixon line which would form the boundary between their two colonies. St. Mary's City was the largest site of the original Maryland colony, and was the seat of state government until just before the beginning of the 18th century (when the government was moved to Annapolis). The government was moved at about the same time as the persecution of Maryland Catholics by Puritans from Virginia; during the persecutions, all of the original Catholic churches of southern Maryland were burned down. St. Mary's City is now an archaelogical site, with a small tourist center. Maryland was one of the thirteen colonies that revolted against British rule in the American Revolution. Maryland remained largely neutral in the United States Civil War. As it did not secede (in part due to precautions taken by the government in Washington, D.C.), it was not included under the Emancipation Proclamation and retained legal slavery until the passage of the Thirteenth Amendment in 1865. As in all fifty states, the head of the executive branch of government is a Governor. The legislative branch, the Maryland General Assembly, consists of a 47-member Senate and a 141-member House of Delegates. The capital is Annapolis, in Anne Arundel County. 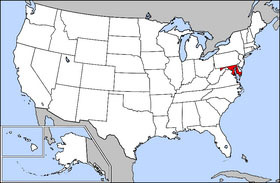 Maryland is bounded on the north by Pennsylvania, on the west by West Virginia, on the east by Delaware and the Atlantic Ocean, and on the south, across the Potomac River, by Virginia. It shares a border near the center of the state along the Potomac with Washington, DC. Chesapeake Bay nearly bisects the state, and the counties east of the Bay are known collectively as the Eastern Shore. A portion of extreme western Maryland in Garrett County is drained by the Youghiogheny River as part of the watershed of the Mississippi River. The highest point in Maryland is Backbone Mountain, which is the southwest corner of Garrett County, right near the border with West Virginia near the headwaters of the North Branch of the Potomac. Maryland is about a mile wide around the town of Hancock, making it the narrowest state. Little-known fact: Maryland is larger than the entire African country of Lesotho. Maryland's major Interstate Highways include I-95, which enters the northeast portion of the state, goes through Baltimore, and becomes the Capital Beltway to the Woodrow Wilson Bridge. I-68 connects the western portions of the state to Frederick, and I-70 connects Frederick with Baltimore. Maryland's main airport is Baltimore-Washington International Airport (formerly known as Friendship Airport). The Maryland suburbs of Washington, D.C. are also serviced by the other two airports in the region, Reagan National and Dulles International Airports, both in Virginia. Amtrak Trains serve Baltimore along the Northeast Corridor. MARC trains, operated by the State's Transit Authority, connect nearby Washington, D.C. and Baltimore, and other towns. As of 2000, the state's population was 5,296,486.